with her husband, Paul V. Buckley. 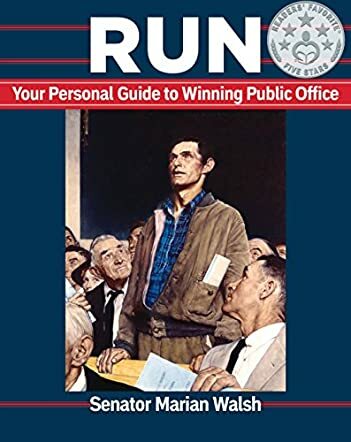 Run: Your Personal Guide to Winning Public Office by Senator Marian Walsh is an informative guide that lays out the necessary tools for candidacy, perfect for first-timers or re-elections, candidate supporters and informed voters. Each detailed chapter explains the political process in layman’s terms, while motivating positive change from challenging work. As a seasoned public servant who never lost an election, Walsh describes her own professional experiences as an attorney, public affairs consultant, ethics lecturer and the first female elected to her seat. At the heart of her insightful message is a belief in self, knowing what issues matter and how to cultivate the qualities needed to live citizenship. This how-to book categorizes the reasons to become a candidate and how to bring people of different points of view together. It studies the fast-moving campaign facets, voter lists, polls, fundraisers, phone banks, standouts, speeches, marketing literature and public appearances with breadth and believability. Senator Marian Walsh in Run: Your Personal Guide to Winning Public Office leaves no stone unturned in the navigation of a race to public office that zigzags. Walsh stresses the importance of connecting with the people, learning from the past and using mentors as an example of leadership. I found her heart-warming perspective to be non-egotistical and other-oriented, which is why Senator Walsh has been an effective leader. This easy-to-read manual is nothing short of spectacular in its heroic honesty about how to win a political race. Anyone thinking about running for office, even on a local level, should pick up a copy today! I've been a political junkie since I was old enough to hold a campaign sign. Sen. Walsh ' s book "Run" is the most useful how - to book on running a winning campaign I've ever come across.